Welcome to Customerania - the world of Shoppe Keep 2! You play as a trusty town merchant, tasked with selling armour, food, clothes, potions and weapons to warriors and rogues. Shoppe Keep 2 is an open-world fantasy business management game, inspired by the NPCs we know and love from classic RPGs and MMOs. Embark upon an entrepreneurial pursuit either in single-player or with 2 - 4 players in online multiplayer. Jumpstart your business escapade by designing your store and stocking it with goods of your choice. Order items through suppliers, or take on lucrative and dangerous missions in the wilderness to secure high quality stock that will fetch higher prices and profits. Expand your Shoppe from a single room to a multi-storey bonanza! Watch customers flood into your store looking to buy new clothes, weapons and food. However, keep an eye out and defend your store from tricky thieves ready to snag your valuable items and make a dash for the door! 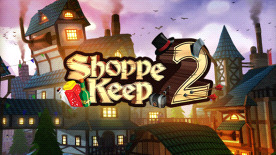 Clean, repair, renovate and upgrade your store as you race to become the most successful Shoppe Keeper in Customerania. Sweep the floors, maintain displays and impress customers to boost your customer satisfaction and store reputation. Indulge in shoppe customisation with a range of flooring, wall and interior designs available. Colourful wildlife, mobs of six foot spiders, wolves, farmland goats and bandits roam the lands beyond the gates of Customerania. Make sure to arm yourself with a trusty sword, bow or staff, and venture out to see what discoveries await you! Collect fur, equipment and more to sell in your Shoppe. As your Shoppe grows and evolves, so will the town around you. Customerania is home to various characters and services - work with cooks and blacksmiths to secure a steady supply of stock. A successful shoppe means a richer town. Upgrade the town to unlock new stock to sell, bring more customers into your store and more. As powerful new citizens arrive, decide who to work with - but be aware that your decisions will reap specific benefits and drawbacks from competing families. Can you rise from zero to well-coined hero? Have you got what it takes to run a profitable business amidst the chaos of thieves, spiders and bandits?